Those who wield power channeled from the gods command the very forces of creation. 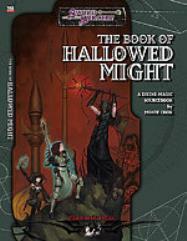 The Book of Hallowed Might offers exciting options for workers of divine magic, including over 100 new spells, classes, magic items, feats, and more. Plus, the book includes an all-new look at the paladin class and the alignment system. Characters of all levels can use this source material in any fantasy campaign. If you liked the Books of Eldritch Might, you don't want to be without this essential companion volume. Make Yours the Strength of the Heavens!